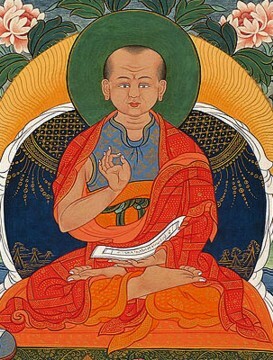 Geshe Langri Tangpa (Tib. དགེ་བཤེས་གླང་རི་ཐང་པ་, Wyl. dge bshes glang ri thang pa) (1054-1123 ), aka. Langthangpa Dorje Senge (གླང་ཐང་པ་རྡོ་རྗེ་སེངྒེ་glang thang pa rdo rje seng+ge) — a famous Kadampa master and disciple of Potowa Rinchen Sal, who is best known for composing the Eight Verses of Training the Mind. This page was last edited on 15 November 2011, at 20:17.